Lots of pixels, mediocre performance. 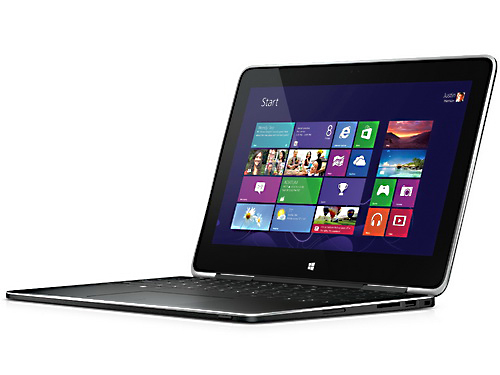 You cannot decide whether to get a laptop or a tablet? 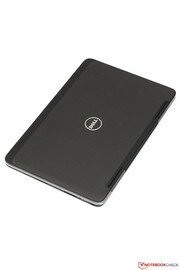 Then a convertible such as the Dell XPS 11 might be the ideal compromise. 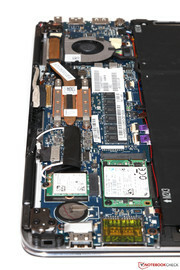 Our review will show how this jack-of-all-trades with a Core i5 CPU, a QHD display and an SSD fares during actual usage. Are traditional laptops becoming obsolete? 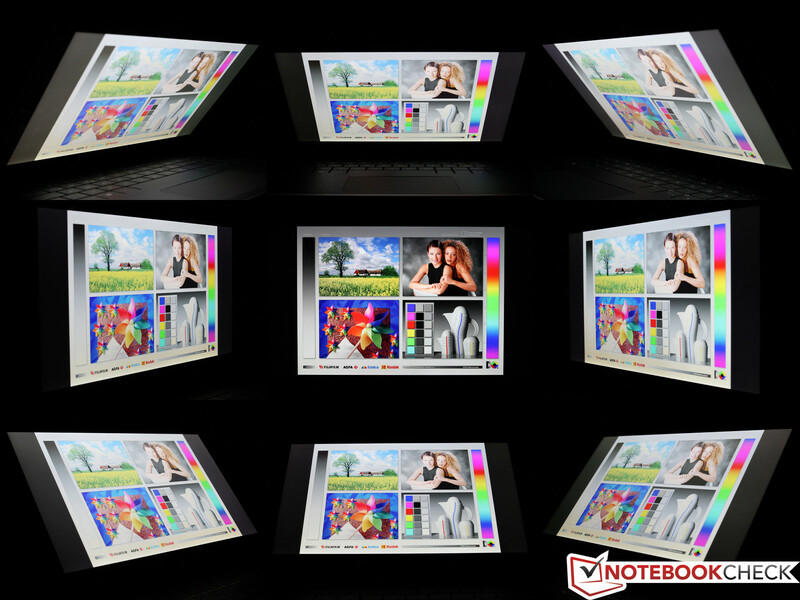 Driven by the growing tablet market, notebooks with versatile and multifaceted form factors are becoming more prevalent. 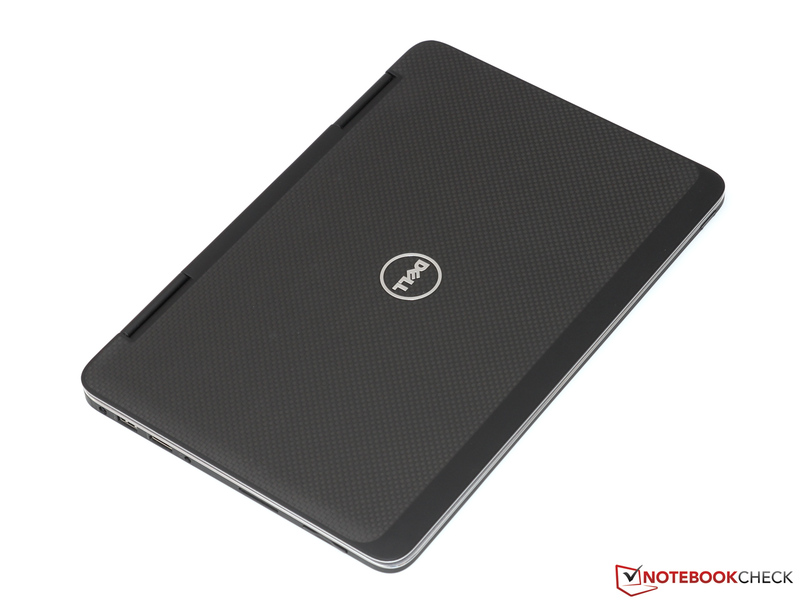 One of the first such convertibles was the Dell XPS 12, presented in fall 2012, a newer model of which is still available. 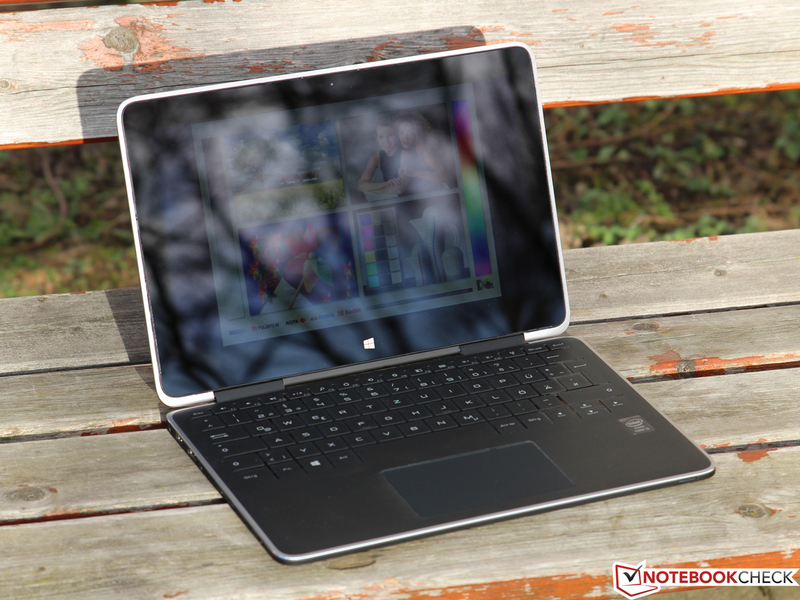 Our test device, the Dell XPS 11 marks a departure into the slightly smaller 11.6-inch territory. This is not just another Dell convertible, but, according to the manufacturer, the "slimmest, lightest and most compact 2-in-1 ultrabook on Earth." But mobility is not its only strong suit. The XPS 11 also comes with an extremely high-resolution IGZO display, a very power-efficient and fast ULV CPU from Intel's newest Haswell generation. Still, all of this comes at a price: Even the Core i5-4210Y entry model with 4 GB of RAM and a 128 GB SSD costs a little more than 900 Euros (~$1218), while our test device with 256 GB of storage space costs around 1000 Euros (~$1353), including shipping fees. 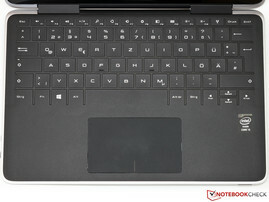 Similar hybrid laptops are currently being offered by both Lenovo and Acer. Thus, we will compare the XPS 11 to two (often noticeably cheaper) models from these two companies, specifically the IdeaPad Yoga 11S and the Aspire P3-171. 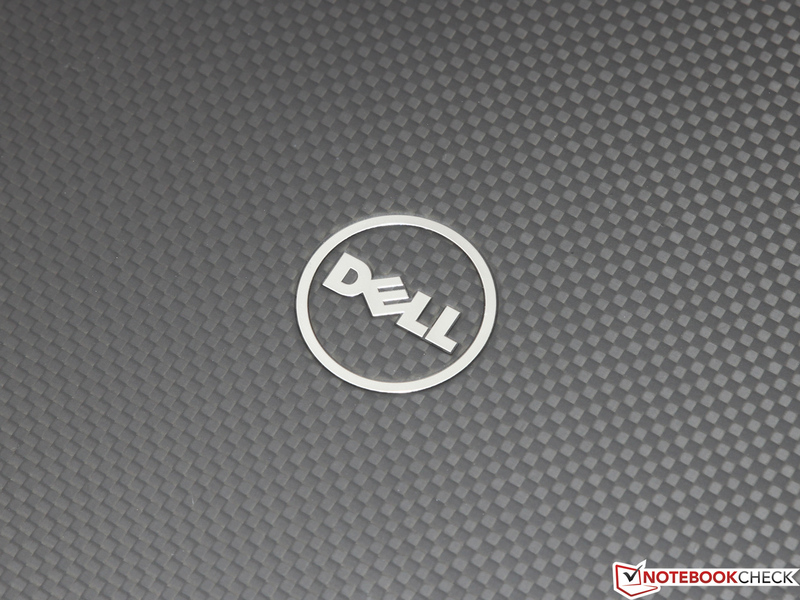 The XPS moniker marks Dell's high-end laptop. Of course, these standards do not just apply to its innards, but also the case. 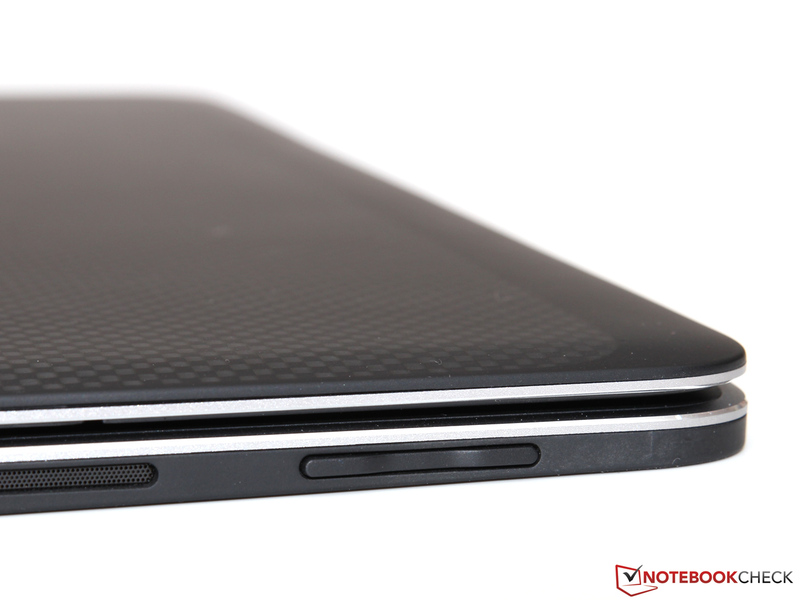 Our test device is no exception, shipping with a true high-end chassis, which is mainly made from aluminum and carbon. 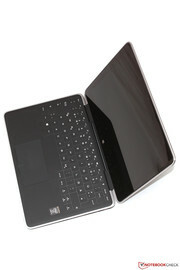 Its materials and its design copy many elements from its XPS siblings, among them a 13- and a 15-inch device. The subtle yet timeless and elegant look underlines its premium aspirations. The only slight disadvantage that we found: The silicone-clad palm rest attracts dirt and fingerprints like nothing else. Thanks to the light and sturdy materials being used, Dell was able to decrease both the weight and the dimensions of the XPS 11 greatly. Just 1.13 kilograms (~2.5 pounds) and up to 15 millimeters (~0.6 inches) in height makes the XPS 11 even slimmer than typical 13-inch ultrabooks (although a slimmer display frame - instead of the 2 centimeters (~0.8 inches) it has now - might have helped greatly in making the device even more compact). 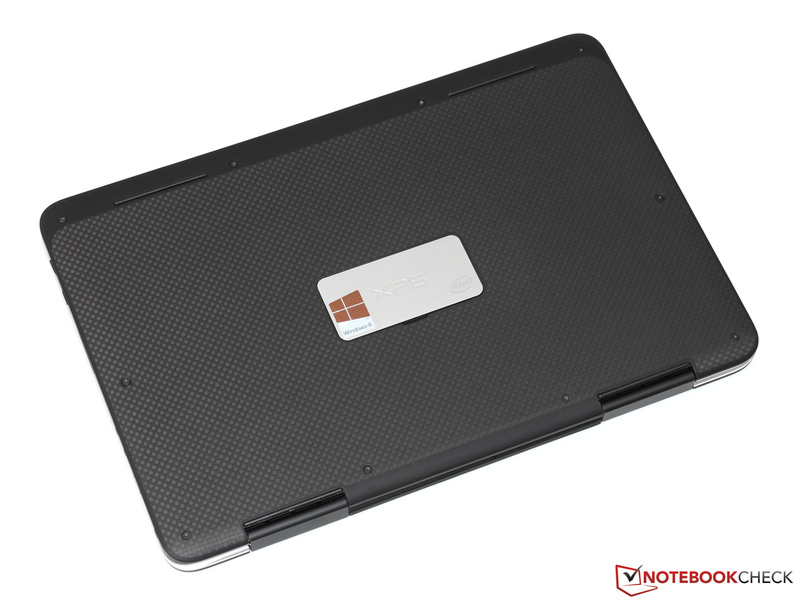 Despite its slim, lightweight construction, the laptop is extremely pressure- and torsion-resistant. This even holds true to a certain degree for the display, which measures just 3 millimeters thick (~0.1 inches). Similar to that of the Lenovo IdeaPad Yoga 11S, the display can be rotated by up to 360 degrees - turning the Dell XPS 11 into a tablet by pushing the display down onto the base unit. 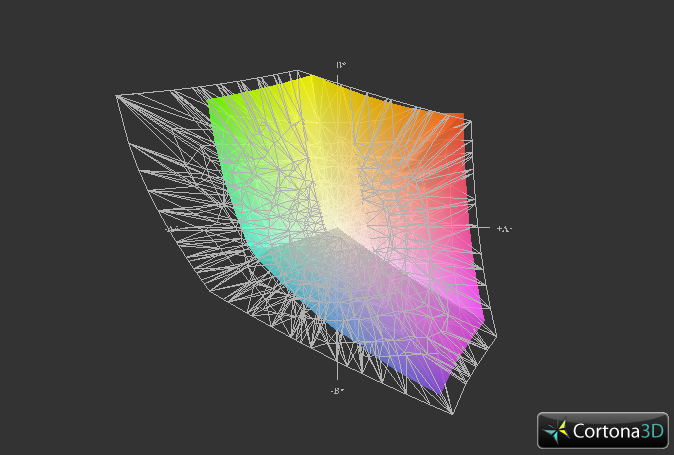 Naturally, everything in between laptop mode and tablet mode is possible as well, yielding e.g. 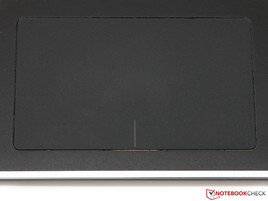 the tent mode which is supposed to make the touchscreen (which comes with Gorilla Glass) more comfortable to use. 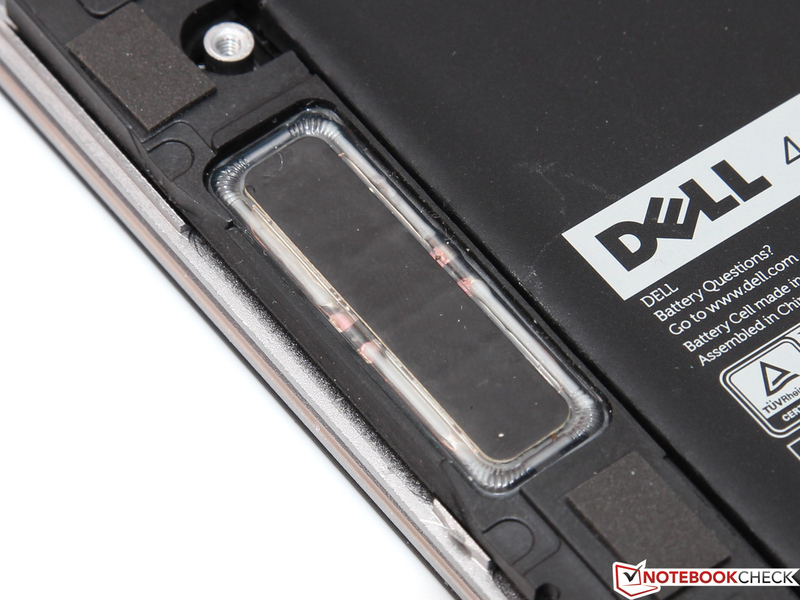 Again, we have to nag a little bit, as the hinges do tend to wobble a bit when applying pressure to the touchscreen. Apart from this, the chassis feels almost perfect. It does of course help that the build quality is great, with basically no uneven clearances or sharp edges being noticeable on our test device. Two USB 3.0 ports (one on each side of the chassis), an HDMI port, a card reader (SD, SDIO, SDXC) and an audio jack – that is it in terms of ports. We are not pleased that the XPS 11 ships without a (Mini-) DisplayPort, since many external displays with resolutions of more than Full HD cannot be connected via HDMI. One rather unusual design element: The USB ports have been rotated by 180 degrees - possibly to render them more convenient when the device is being used in tablet mode. 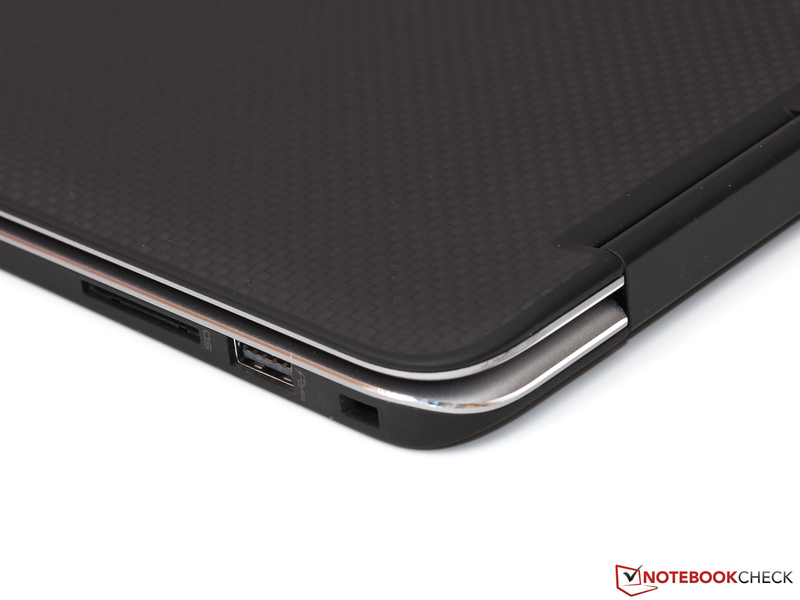 All ports are located close to the rear end of the sides, but remain well in reach due to the compactness of the XPS 11. 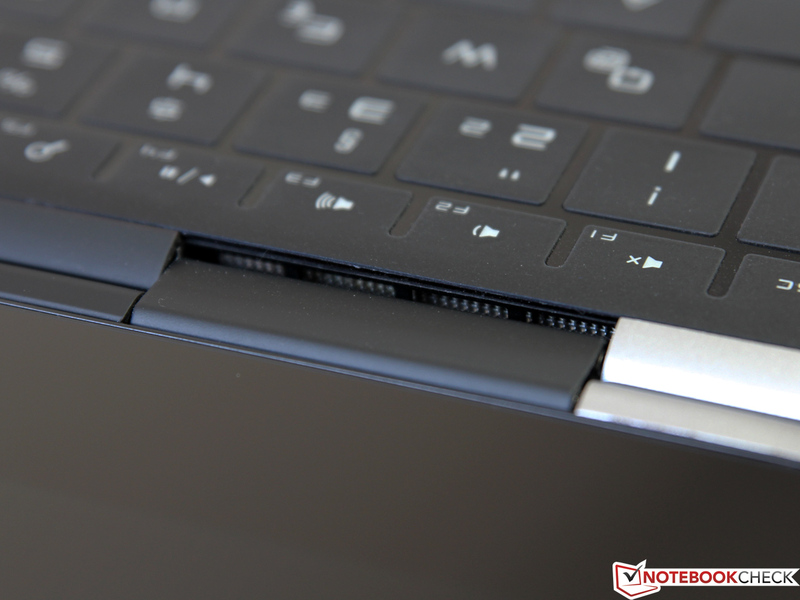 Since the convertible is so slim, thick thumb drives do actually act as a lever, lifting the laptop up. Care has to be taken not to damage either the port or the flash drive itself. Thanks to its integrated wireless modem (Intel Wireless-AC 7260), the XPS fields both Bluetooth 4.0 and Wi-Fi 802.11a/b/g/n/ac, including all current standards. Under perfect conditions, the dual-band (2.4 and 5 GHz) and dual-stream (2x2) adapter would reach up to 867 Mbit/s, but even during our real-life tests with an 802.11n router, speed, range and connection stability were great. Other useful features are Near Field Communication and Wireless Display for external displays and TVs (a decoder box might be required). The only thing we missed - at least optionally – is a WWAN or GPS module. While the webcam does not look like much on paper, shipping with just 0.9 megapixels, it is decently suited for photos and videos, being sufficient for Skype sessions. The same holds true for the microphone. Our voice was clear as well as easily understood. Beyond a quick start guide and the obligatory power adapter, nothing else is in the box. The same holds true on the software side of things: Next to the preinstalled Windows 8.1 (64-bit), only the crucial drivers and a few useful system tools are there. An administration panel, the "My Dell" utility, informs the user about updates, helps with creating backups or yields additional information about the system. 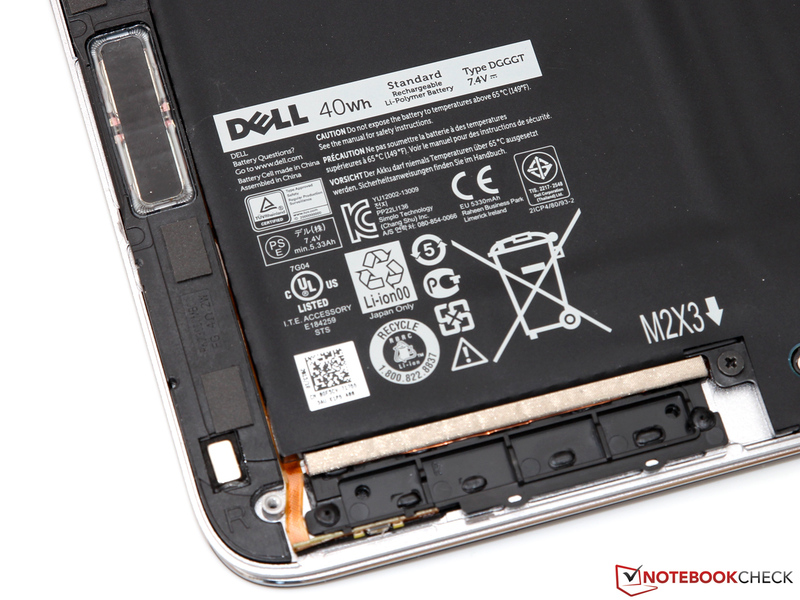 In contrast to most other tablets and convertibles, the innards of the XPS 11 are not completely sealed off. Loosening 10 Torx (T5) screws as well as one ordinary Phillips-tip screw beneath the tiltable XPS logo (details can be found in the Service Manual) allows the user to take off the large maintenance panel. The battery, the Wi-Fi module, the mSATA SSD and the fan are accessible (some require the removal of a few screws) and user-replaceable. The RAM module, however, has been soldered to the motherboard. No upgrades are possible here. As is almost always the case with Dell, the XPS 11 ships with just a meager amount, 12 months, of warranty, but this does at least include pickup-and-return service and telephone support. For 100, 176 or 328 Euros (~$135, $238 or $444), this manufacturer warranty can be expanded to 2, 3 or 4 years, respectively. However, such upgrades are a lot less expensive with most of Dell's competitors. 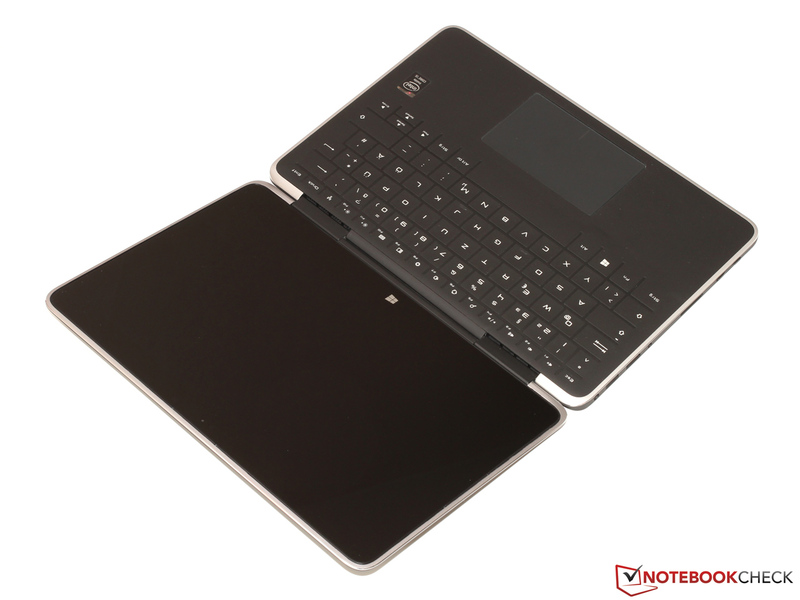 Touch keyboards are a relatively well-known feature in the case of tablets, such as Microsoft's Surface RT and Surface Pro. 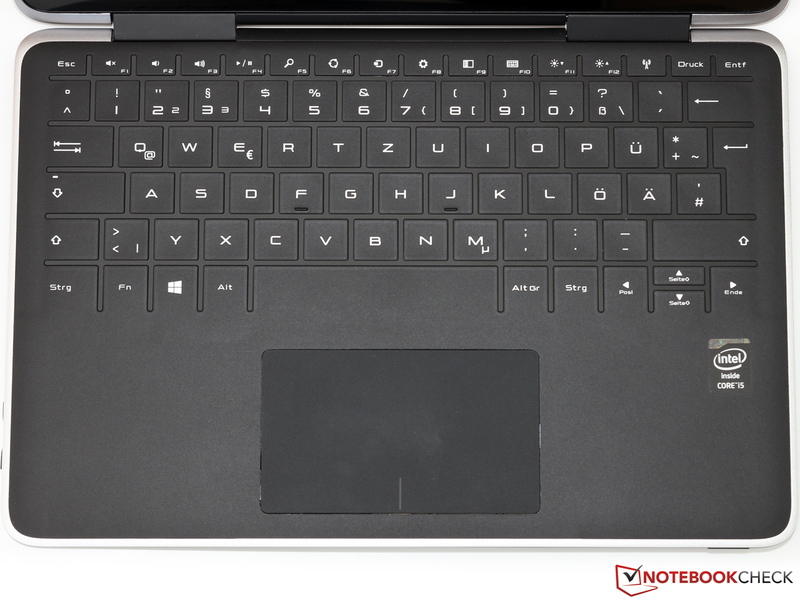 In the base unit of a laptop and a convertible, however, such an input device is still extremely uncommon. Moreover, while its advantages are numerous - yielding a slimmer, less costly and more resistant device, the latter being a crucial feature in tablet mode - the user has to pay a high price. At the beginning, the missing physical feedback is very irritating, leading to a number of erroneous keystrokes, especially since it is easy to underestimate the amount of pressure required to actually write a letter (which is a lot more than that on a touchscreen, yielding a more tiring typing experience). Hitting the illuminated keys is rather simple, thanks to a chiclet-like key grid, which makes it easy to find any letter. In the end, it depends on the user him- or herself whether this still amounts to a useable typing experience; still we would suggest using an external USB keyboard whenever a lot of productivity is required. 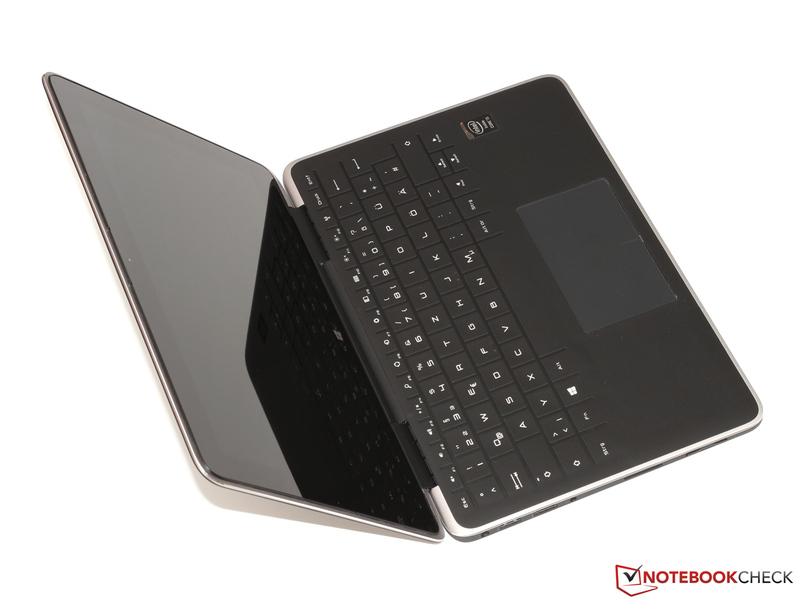 The ClickPad (10.5 x 6.2 centimeters; 4.1 x 2.4 inches) feels close to perfect. Its velvety, soft glass surface makes gliding across a breeze. Multi-touch gestures work smoothly and without hesitation, and the extremely crisp mouse buttons make an external pointing device all but unnecessary - apparently, Dell has put a lot of work into the drivers, which were still a topic of debate with the XPS 15. Of course, there is also the capacitive touchscreen. It supports up to 10 fingers at the same time. Lag is basically non-existent while its precision is superb. 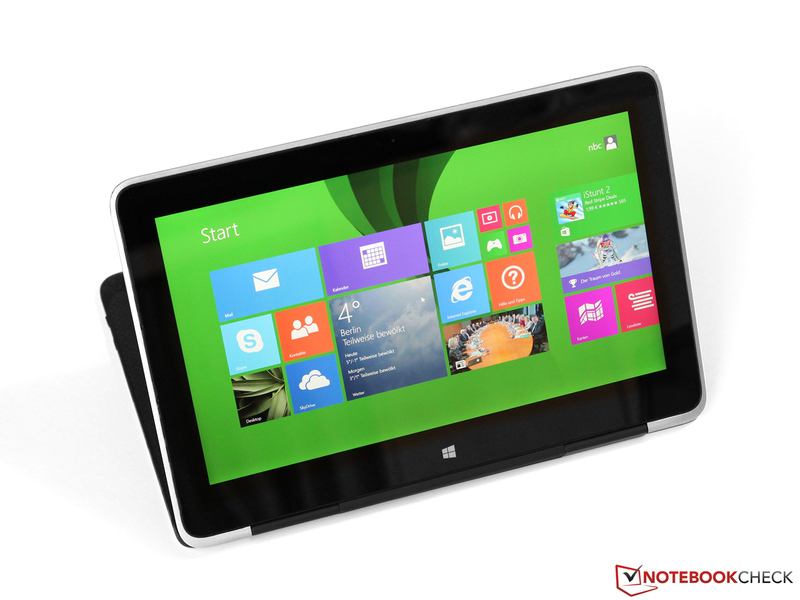 The touchscreen is perfectly suited for the Modern UI of Windows 8.1 while the more traditional desktop experience profits more from a mouse and a keyboard. One of the true highlights of the XPS 11 is its 11.6-inch WQHD display, which comes with 2560x1440 pixels and thus a superb pixel density of 253 ppi. Even the much-appreciated Retina display of the MacBook Pro 13 (13.3 inches, 2560x1600 pixels) reaches no more than 227 ppi while the direct competitor, the IdeaPad Yoga 11S (11.6 inches, 1366x768 pixels) only yields 135 ppi. 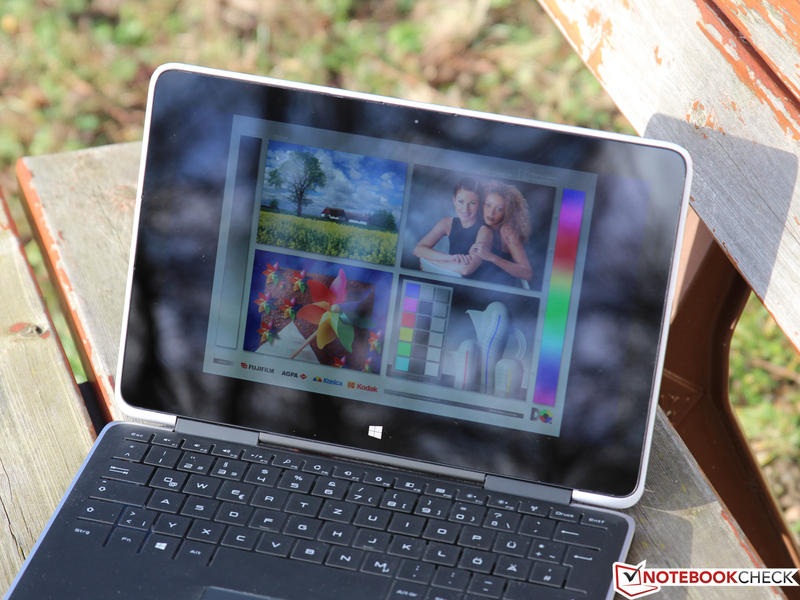 The most crucial question now is whether such an impressive resolution, which has more or less only been known from some high-end ARM tablets, is really necessary in a Windows convertible. Of course, fonts and symbols look sharper than on most every competitor, but even Windows 8.1 still exhibits some scaling issues, especially concerning older legacy software, which do not work well with changed ppi settings, cutting off texts, distorting elements and so on. Still, these (rather rare) issues are not of Dell's doing, and they occur in other high-resolution Windows 8 laptops as well. The LED backlight of the XPS gets noticeably bright, with up to 385 cd/m², on par or better than its competitors, the Yoga 11S (335 cd/m²) and the Aspire P3 (387 cd/m²). 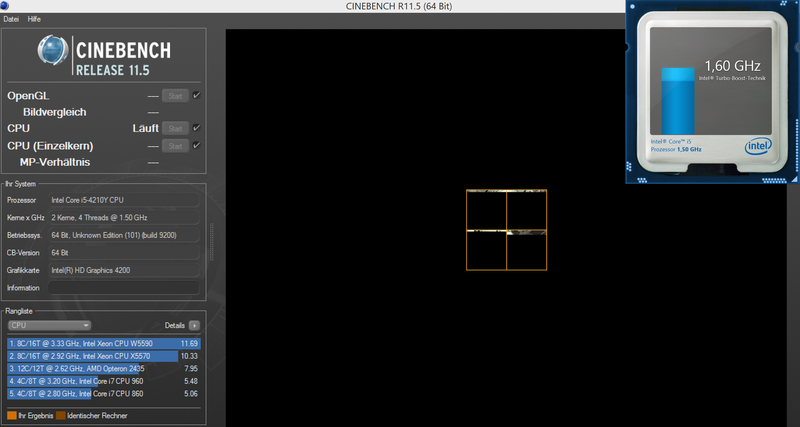 In the lower left corner, only 339 cd/m² are measured, but this dark spot is not noticeable during actual usage. Great: The maximum brightness does not diminish while the laptop is running on battery, at least if the ambient light sensor has been deactivated in the energy-saving settings menu. 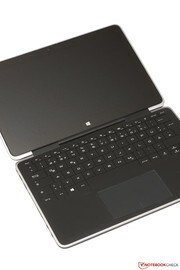 The 11.6-inch panel (LQ116T1) employs Sharp's IGZO technology, which has also been used in the larger XPS 15. Next to the superb pixel density, the black levels (0.28 cd/m²) and the contrast ratio (1450:1) are excellent as well, on par with the best IPS panels out there, leading to vivid, lifelike rendering of all screen contents. Still, apart from the lower resolution, the panels of the Yoga 11S (contrast ratio of 736:1) and the Aspire P3 (1580:1) are more than decent as well. Now we would like to have a look at the color rendition on this display, a topic which is especially important for professionals working with images or photos. 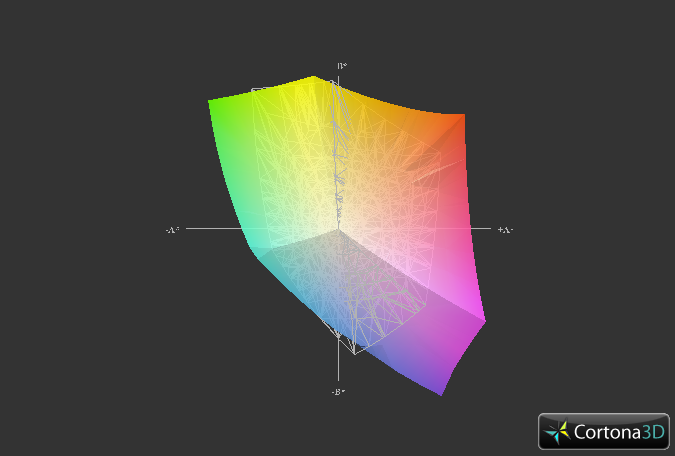 According to our measurements, the display offers a great color range, coming close to being able to render the entire sRGB color space. Unfortunately, the screen has not been calibrated well by the manufacturer. An average Delta E of 8.8 (colors) and 8.2 (grayscale) leads to visible deviations from the reference values - an issue which plagues a lot of consumer laptops. Despite its glossy surface, the XPS 11 is rather well suited for outdoor usage, mainly thanks to its strong backlighting which is usually more than capable of overcoming the resulting reflections in most situations - the only exception being direct sunlight, where only a matte display would help (which is rather uncommon for touchscreens). 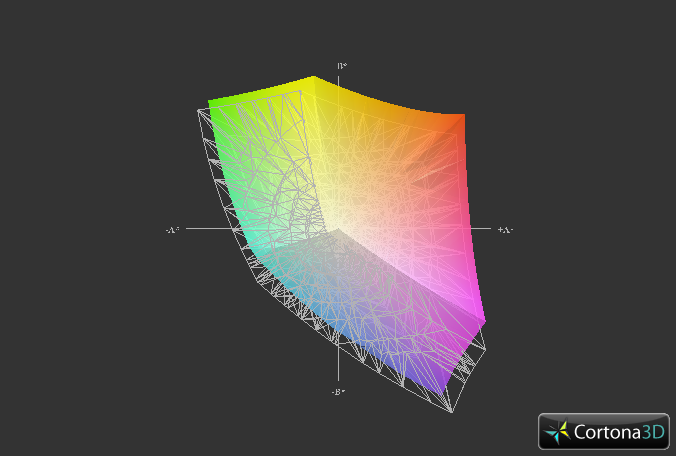 Similar to an IPS panel, the IGZO display offers rather stable viewing angles. The contrast ratio does decrease a bit (as does color saturation) when looking at the screen from an angle, but the issue is not as noticeable as it would be with a much cheaper TN panel. 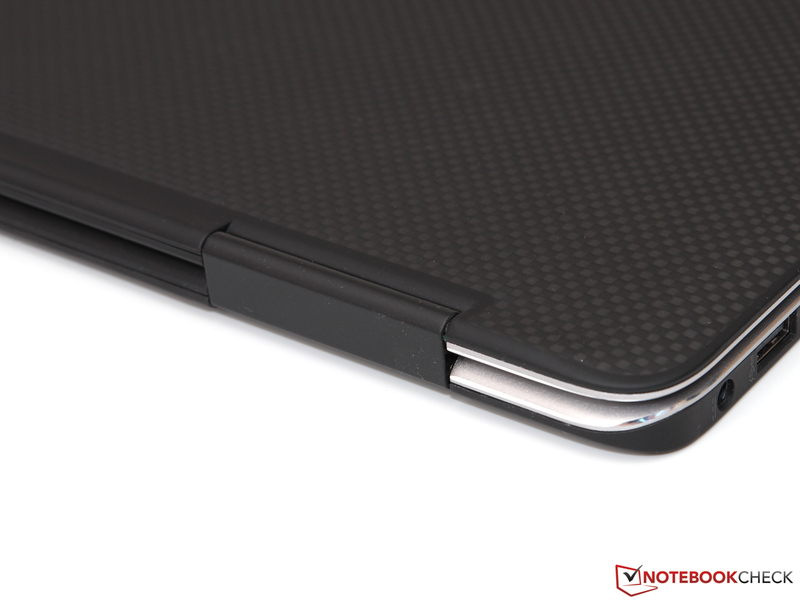 Viewing angle stability is especially important for tablets and hybrid laptops, as the holding angle tends to change a lot. 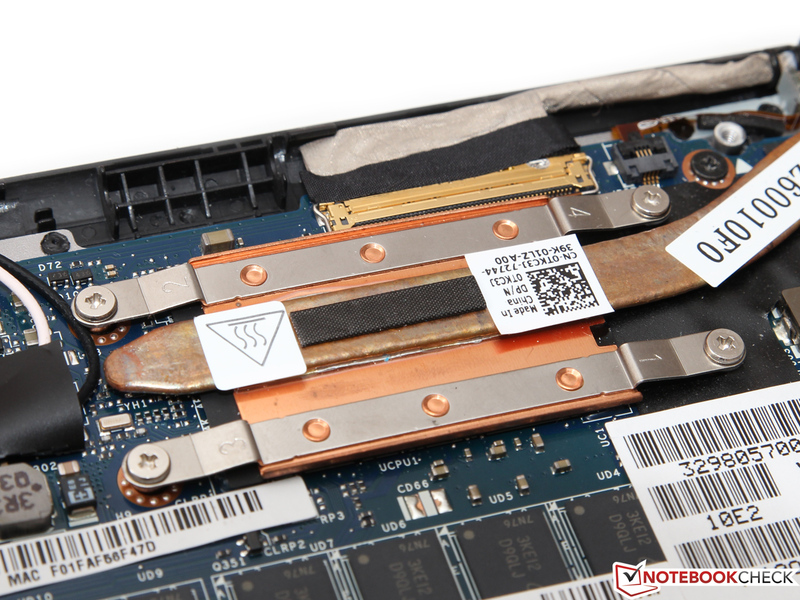 The slim, compact chassis of the XPS 11 likely would not be able to handle the heat produced by a standard 15-Watt CPU (such as the Core i5-4200U) which is why Dell has opted for an even more power-efficient Y-series CPU instead, the Core i5-4210Y which comes with a TDP of just 11.5 Watts. 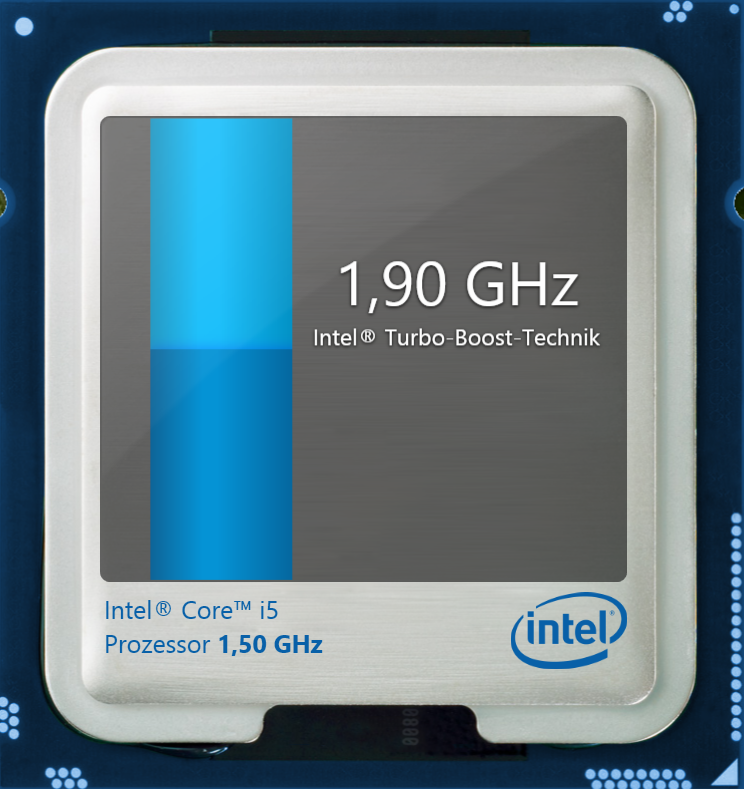 Unfortunately, this leads to a rather low clock speed of 1.5 to 1.9 GHz (with maximum Turbo Boost). 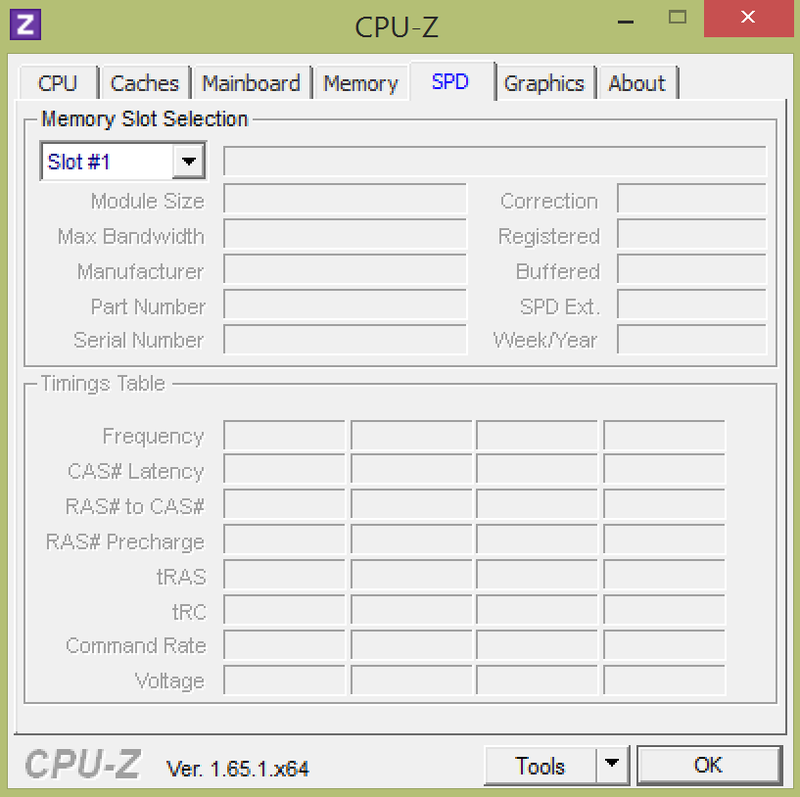 The feature set, however, remains on par with its non-Y-series siblings, including technologies such as Hyperthreading, AES-NI and AVX(2). 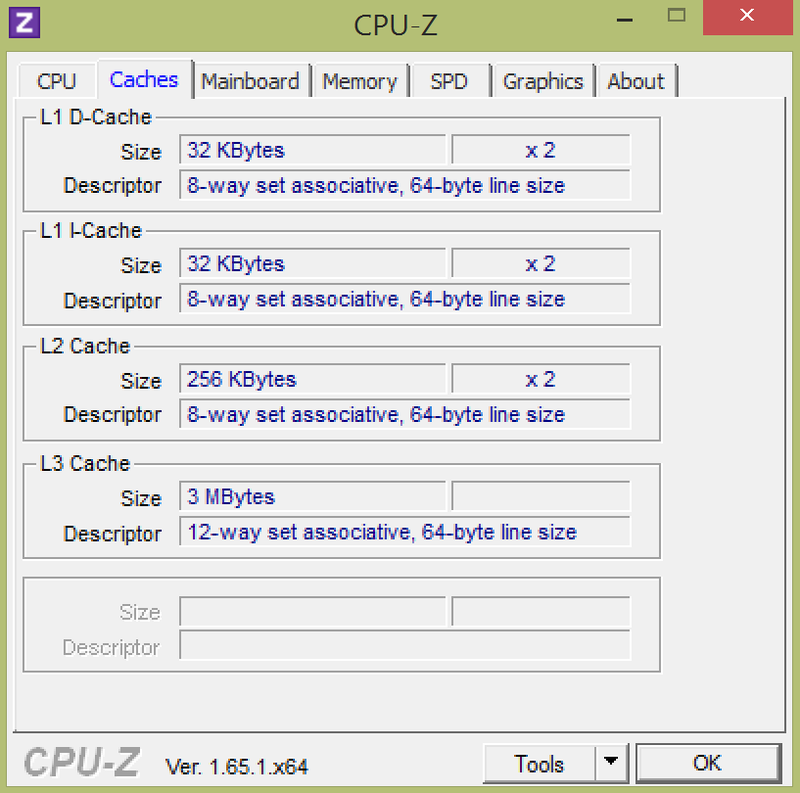 As always, additional details can be found in our CPU database. 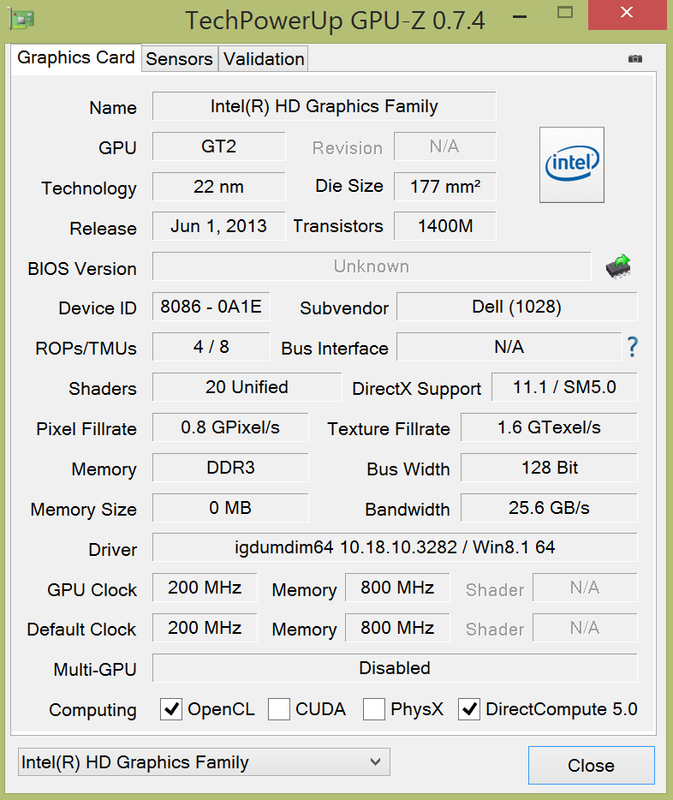 An Intel HD Graphics 4200 GPU has been integrated directly into the CPU. 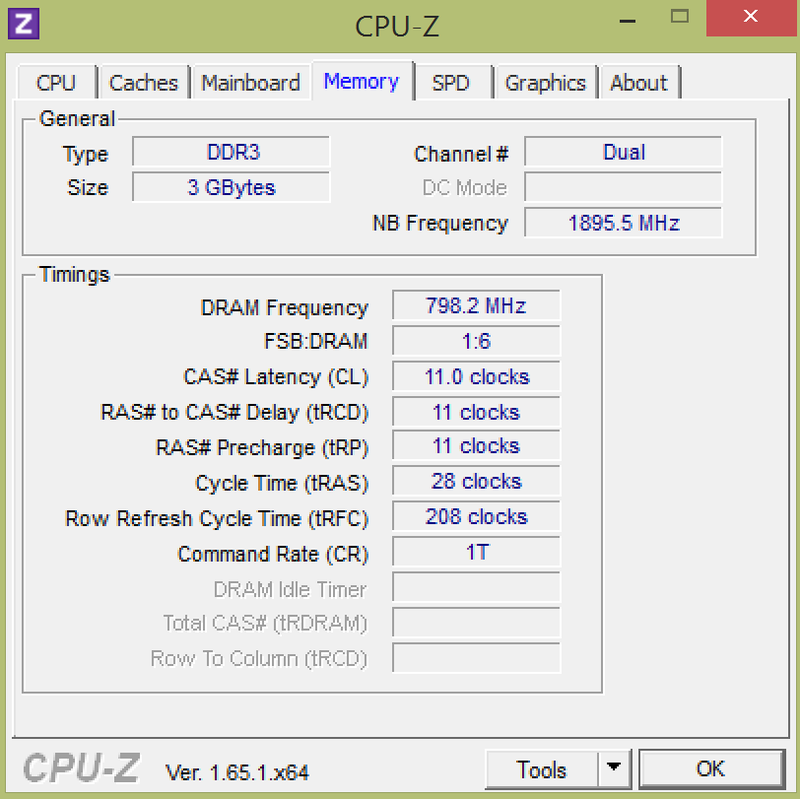 Although it is technically the same as the HD Graphics 4400 used in the 15-Watt models (GT2 extension, 20 execution units), the clock speed is noticeably lower again at 200 to 850 MHz, yielding a somewhat reduced performance. 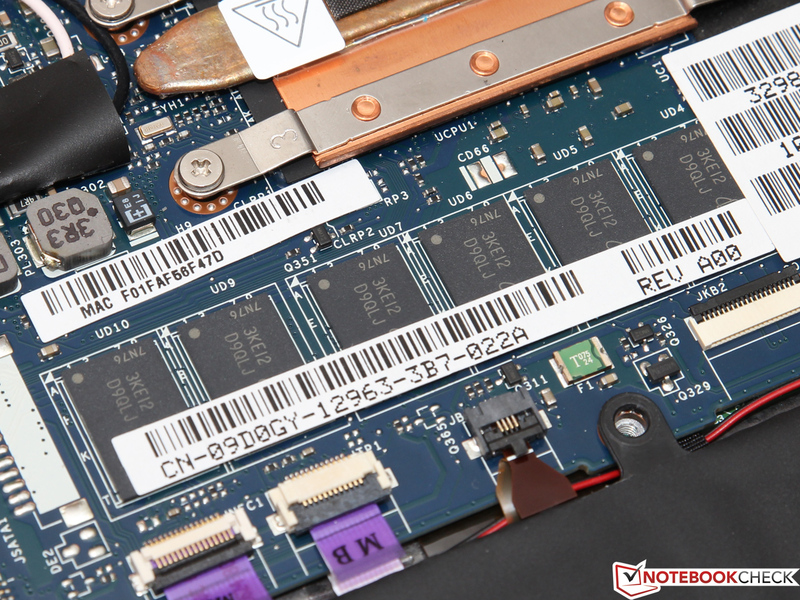 Dell is a bit tight in terms of RAM: The XPS 12 cannot be had with more than 4 GB, but at least the DDR3L-RS-1600 RAM module (soldered to the mainboard) works very efficiently due to its decreased voltage and its dual-channel mode. 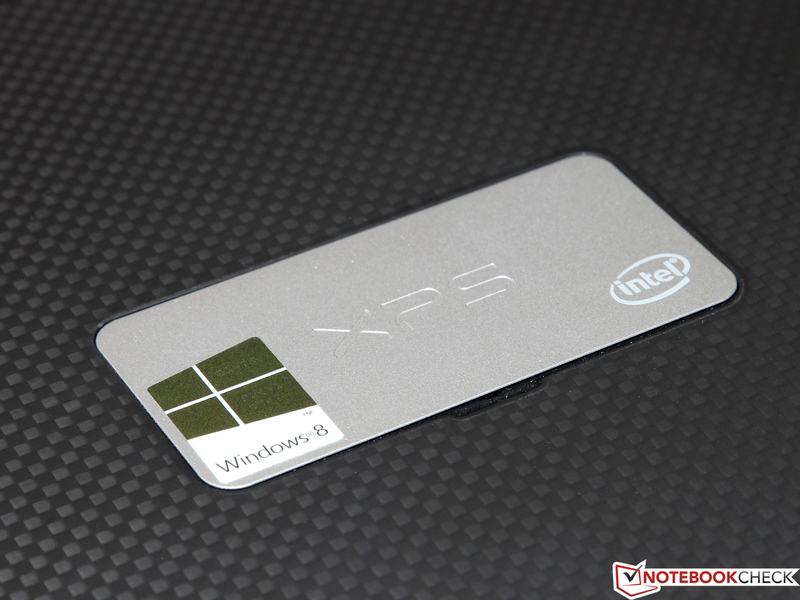 The 256 GB SSD being employed in our test device should be more than enough for most users. For 80 Euros (~$108) less, the XPS 12 can be had with 128 GB instead. 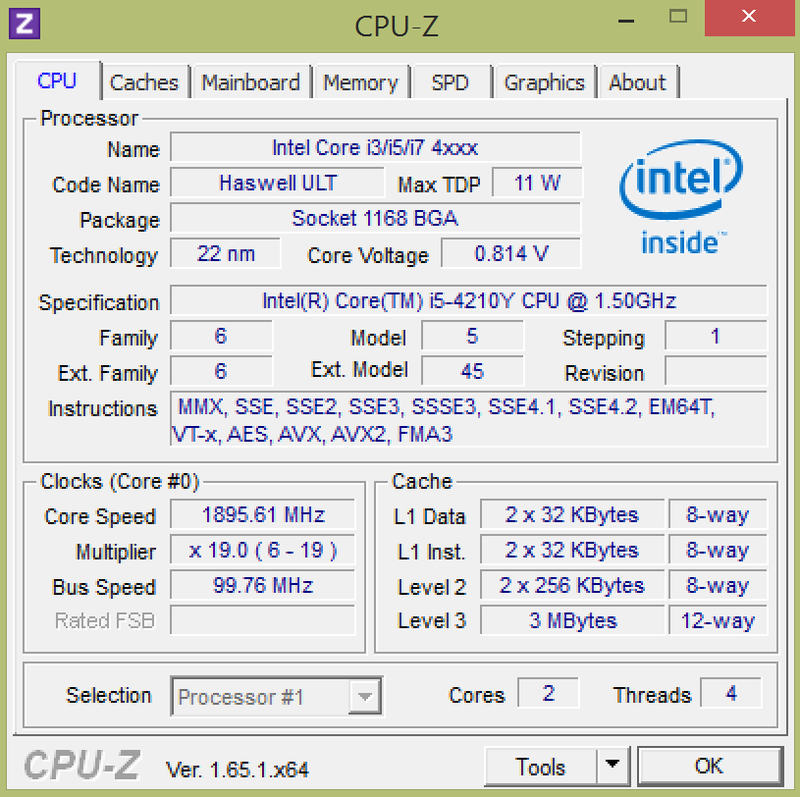 Although the Core i5-4210Y CPU sports rather lowly CPU clock speeds, it is incapable of reaching its full Turbo Boost speed. 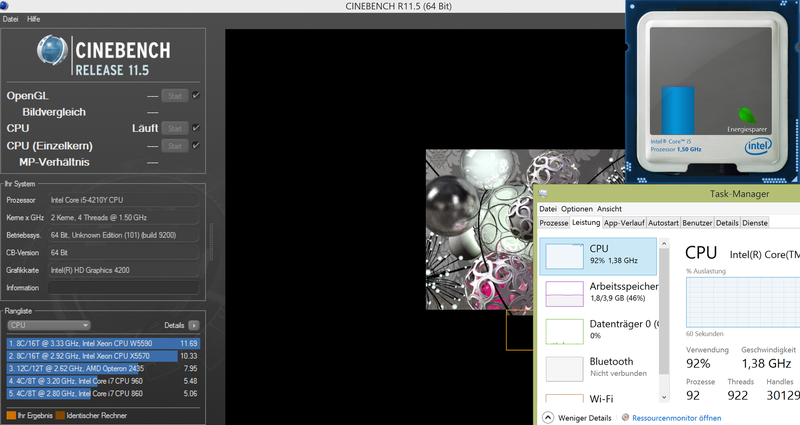 Single threading benchmarks such as those of Cinebench R11.5 are handled with a rather stable value of 1.8 to 1.9 GHz, but multithreading leads to a reduction to 1.6 GHz and then quickly to 1.4 GHz (in extreme cases, such as with Prime95 running even at 1.3 GHz), less than the base clock speed of 1.5 GHz. 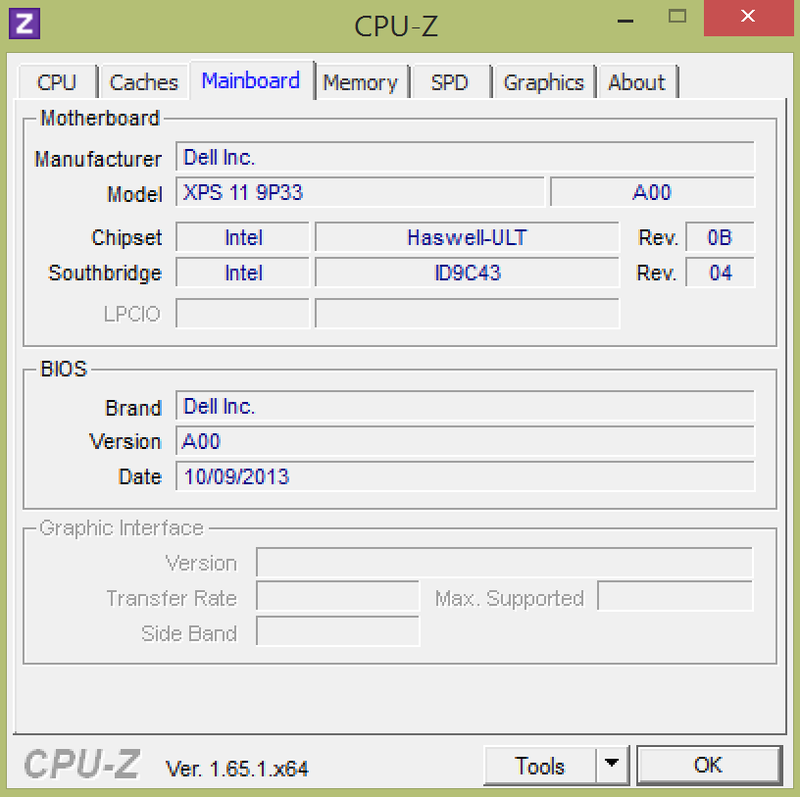 This is unlikely to be an issue of the XPS 11 as most other Haswell-Y-based laptops exhibit similar issues. 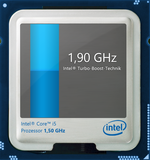 It might actually be possible that this throttling happens on purpose in order to increase battery life and reduce heat emissions, as Intel claims an SDP of just 6 Watts (the typical power consumption) for the Core i5-4210Y, just half the TDP of 11.5 Watts. In the end, performance is noticeably worse than that of 15-Watt variants, with e.g. 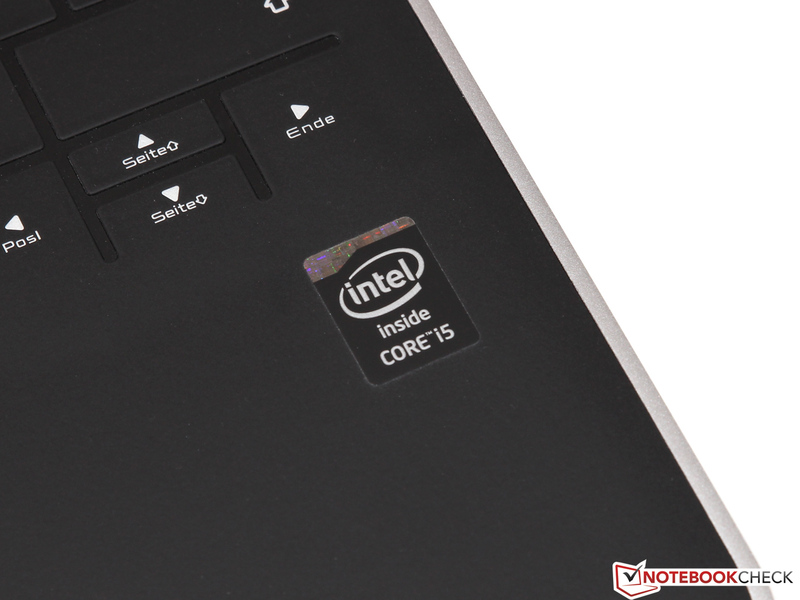 the popular Core i5-4200U being faster by 40 to 50 percent, depending on the application. 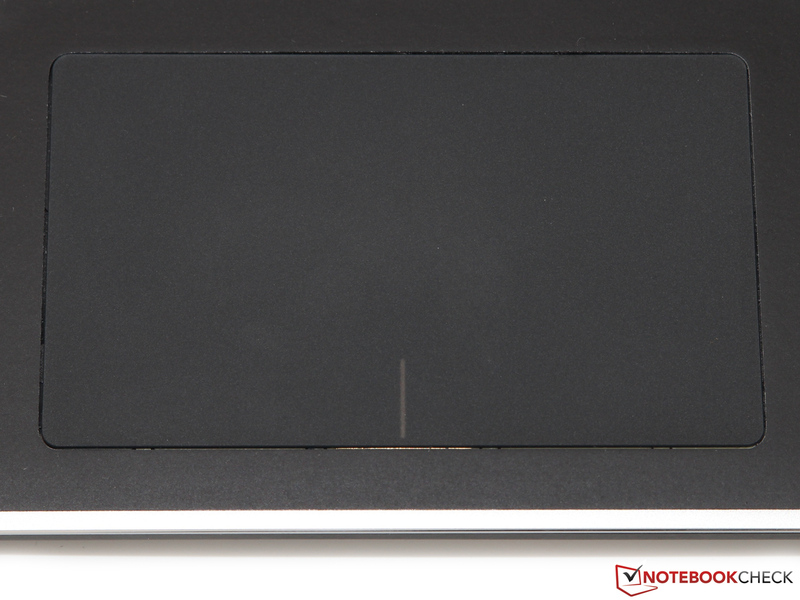 Due to the slim chassis, the XPS 11 employs a compact mSATA SSD instead of a 2.5-inch drive. 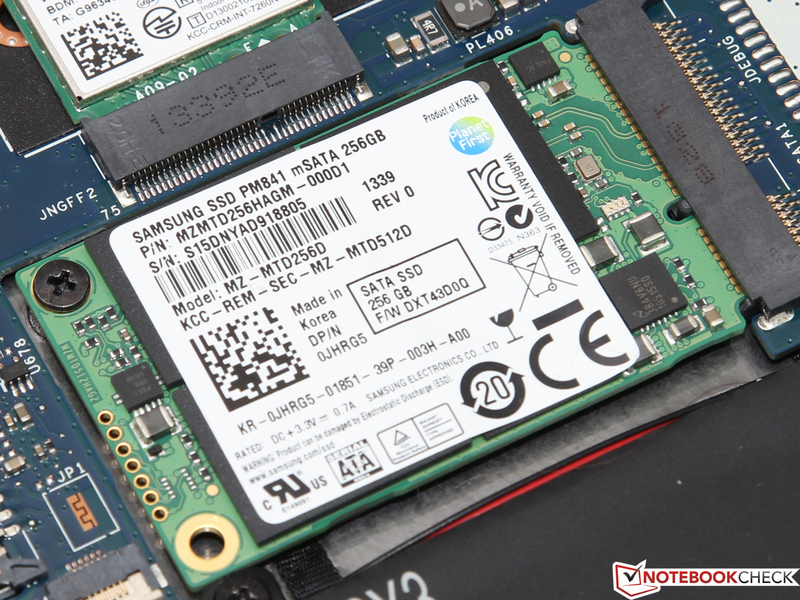 The merits of the Samsung SSD PM841 are already well-known from competitors such as the Sony Vaio Tap 11: High sequential data transfer rates (the 128 GB variant may be a bit slower) as well as great 4K results turn the PM841 into a highly capable SSD. 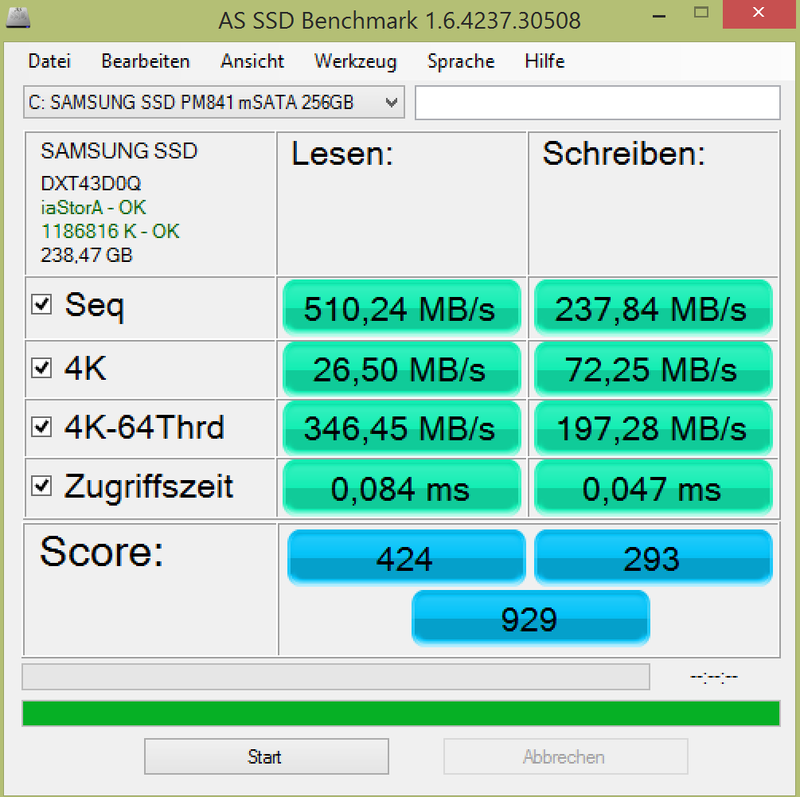 In addition, recent Samsung SSDs have a reputation of being extremely reliable. 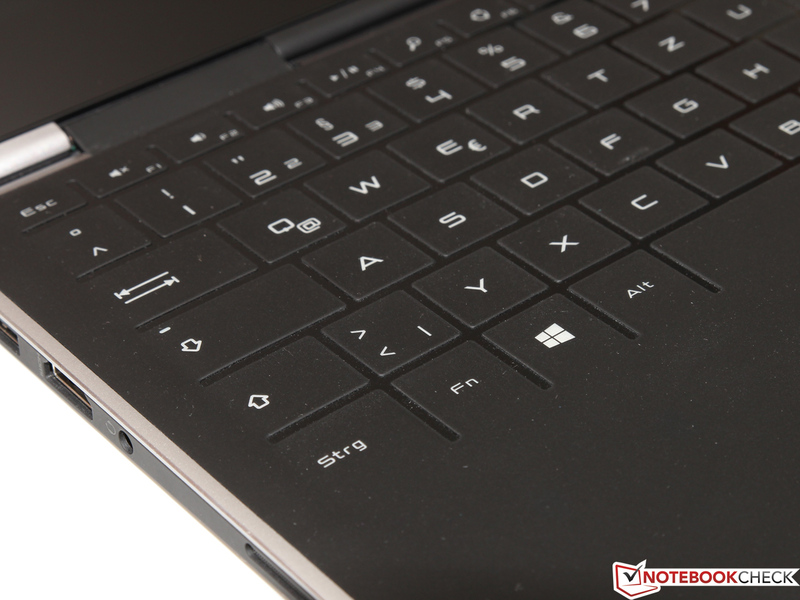 The PCMark 7 system benchmark results of our test device - 4009 points - are close to that of its competitors, the IdeaPad Yoga 11S (3935 points) and the Vaio Tap 11 (3661 points). This should not come as a huge surprise as all three laptops employ the same SSD and comparable CPUs. 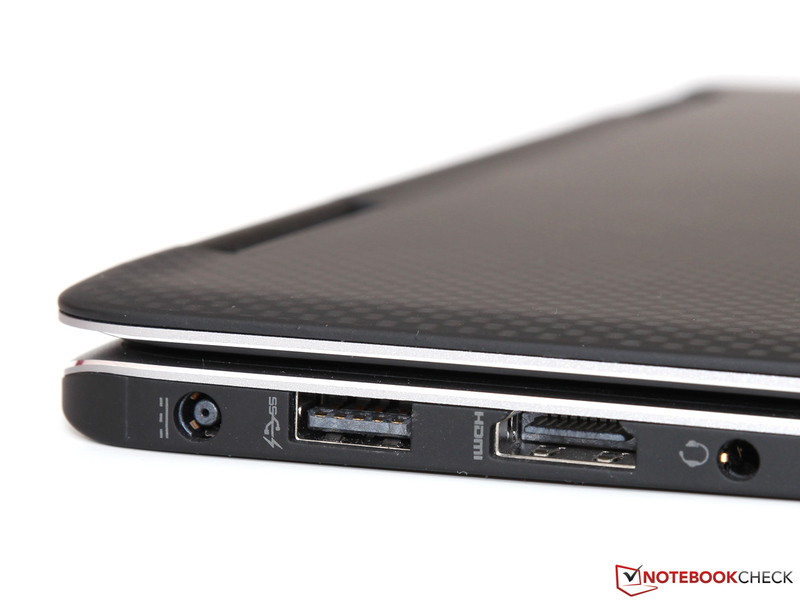 The Aspire P3 fares a bit worse due to its Core i3 CPU and its smaller SSD. 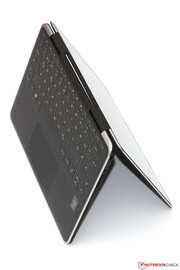 Typical everyday tasks such as browsing the web, working with MS Office or video playback are no problem for the XPS 11. 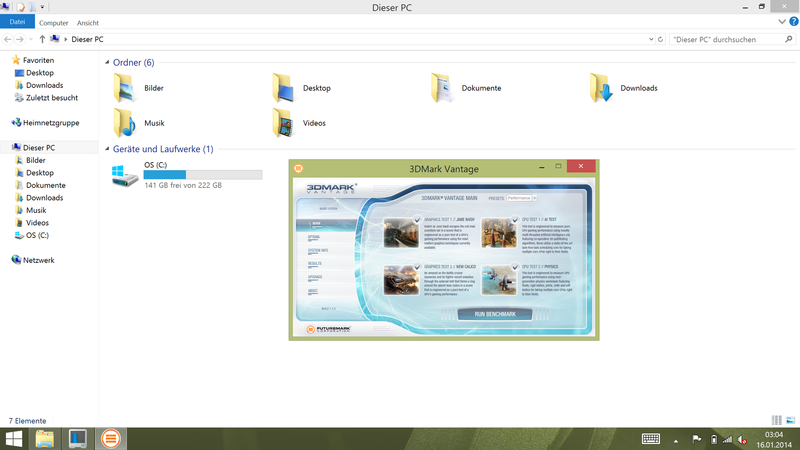 The fast SSD is one of the main reasons why the system feels so responsive. Only more demanding software or excessive multitasking may bring the XPS 11 to its knees, due to the low CPU clock speed and the meager amount of RAM. This is not really a performance-oriented device. Not only the CPU, but also the GPU hardly ever comes close to its maximum possible clock speed, yielding only 400 to 450 MHz in most 3D applications and games. This is close, in terms of performance, to an older HD Graphics 4000 (Ivy Bridge) so that even older, dedicated entry-level GPUs such as the Radeon HD 6470M manage to beat the HD Graphics 4200. The latter is better suited for multimedia tasks, mostly due to its integrated Quick Sync transcoder, which enables it to convert videos very quickly and power-efficiently. 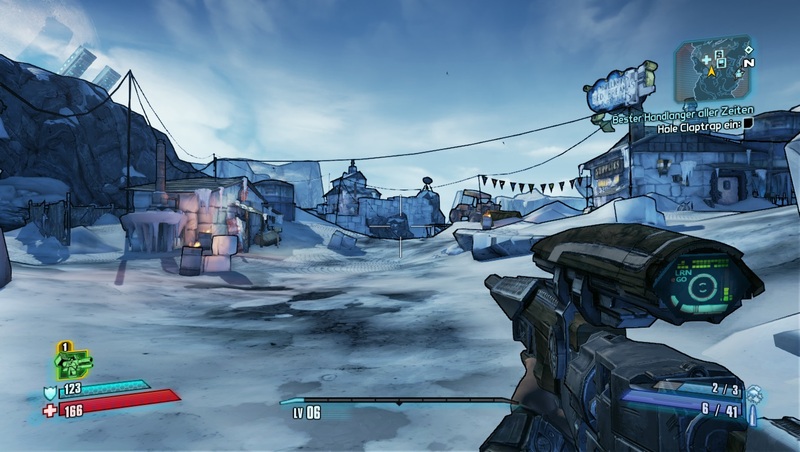 Due to the weak 3D performance, the XPS 11 is not a great gaming rig. Even when everything is set to minimum, with a resolution of 1024x768, more than 30 fps - a value crucial for a smooth gaming experience – are barely ever reached in modern games, the only exceptions being Anno 2070 and Diablo 3, which are at least somewhat playable (although not pretty). 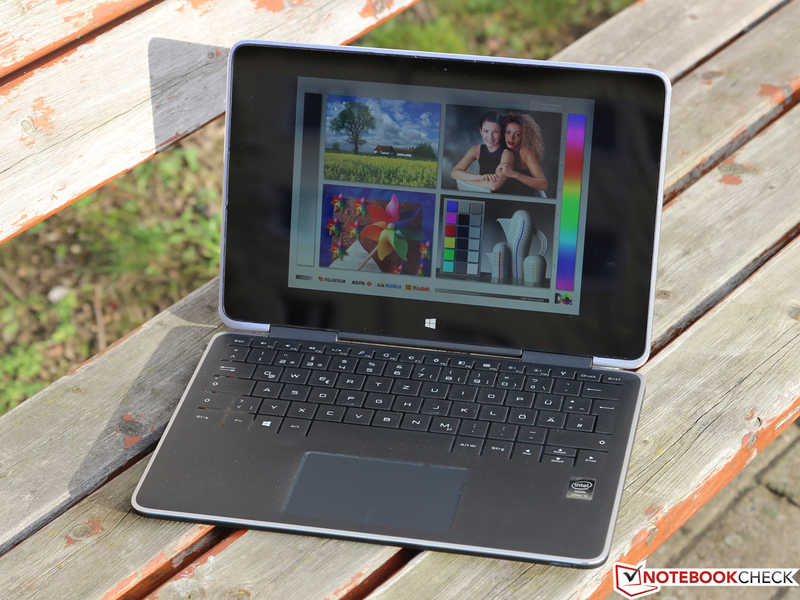 A typical ultrabook with an HD 4400 GPU yields approximately twice the graphics performance. 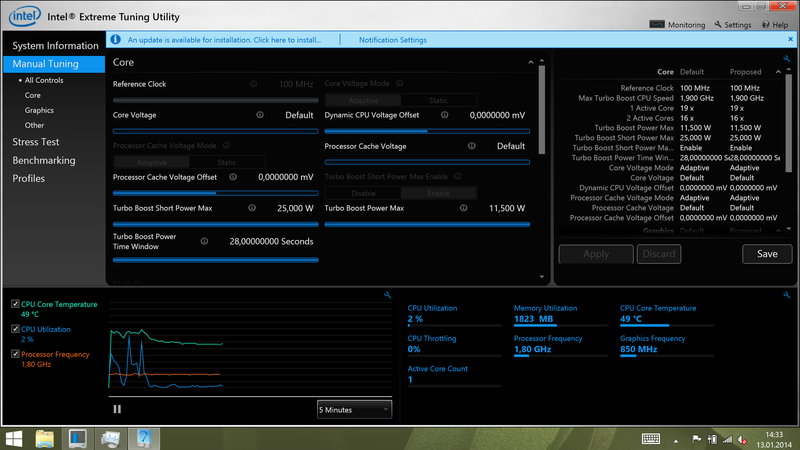 While the even more power-efficient Core i5-4202Y (SDP of 4.5 Watts SDP, e.g. 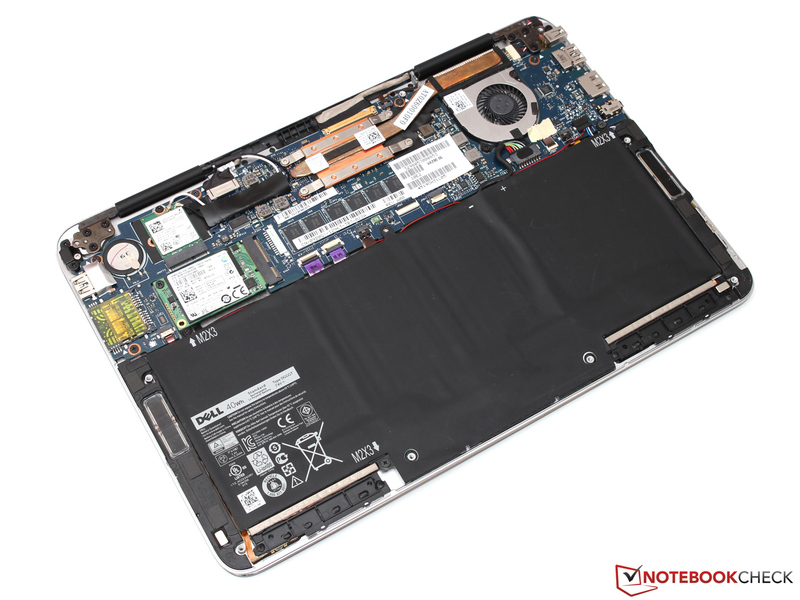 HP Spectre 13 x2) can be used in a fanless, completely passively cooled system, the Core i5-4210Y runs a bit too hot for that. Still, the fan used in the XPS 11 never gets annoyingly loud, reaching no more than 32.2 to 34.5 dB(A), even under full load. In many cases, the convertible will not be noticeable against the ambient noise. While idle (or barely being taxed), the convertible remains completely silent, with the fan being turned off. 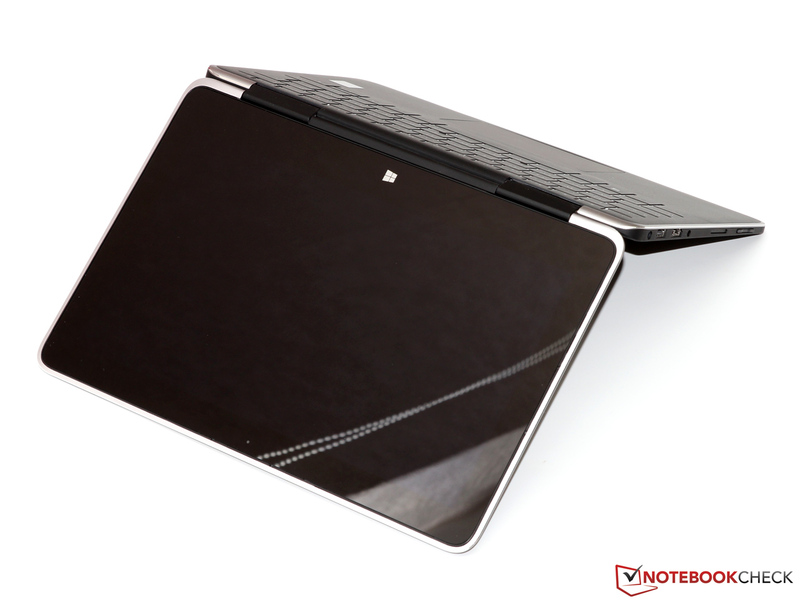 Neither the Acer Aspire P3 nor the Lenovo's Yoga 11S manage such a feat. Luckily, the silent operation does not lead to hot surfaces. We measure between 28 and 32 degrees Celsius (82.4 and 89.6 Fahrenheit) locally, and up to slightly more than 40 degrees (104 Fahrenheit) in a small area right above the keyboard. This should hardly be an issue for most users. The XPS 11 can easily be used on the lap (or as a tablet in one's hands) even for prolonged stretches of time. As we have already written, the CPU tends to exhibit severe throttling, even before reaching its designated TDP, and even though its temperatures of around 65 degrees (149 Fahrenheit) are not yet critical. In our stress test, the CPU clock speed decreases to 600 MHz, with a GPU clock speed of a slightly less disappointing 400 MHz. 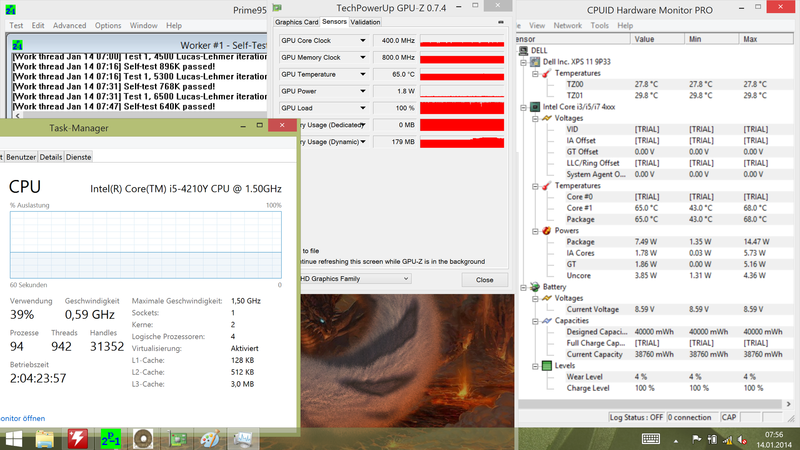 At the same time, the power consumption of the chip levels off at around 7.5 Watts, 4 Watts less than the official TDP. 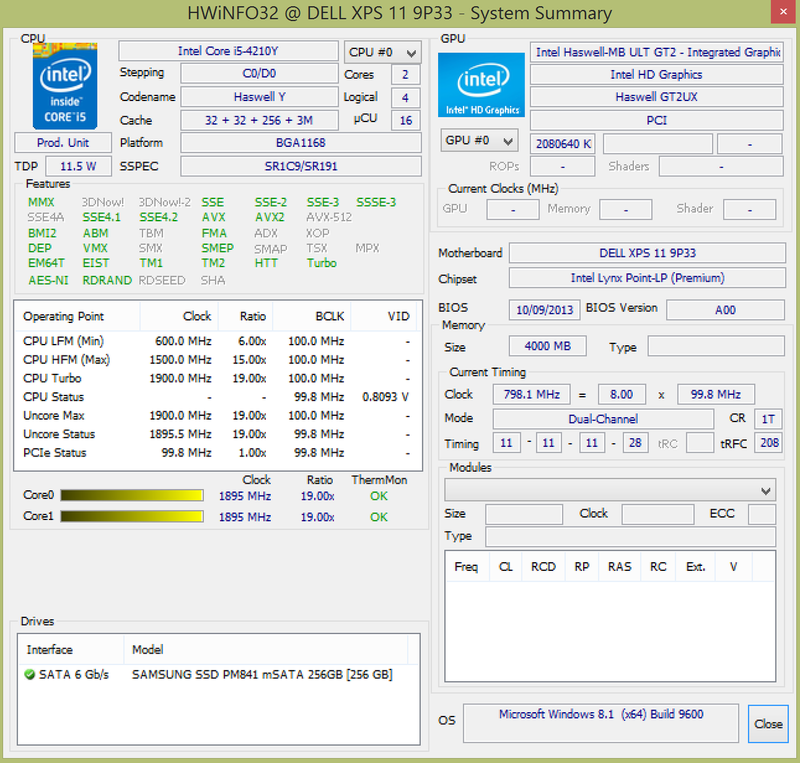 Interestingly, the correct value of 11.5 Watts seems to have been implemented in the BIOS according to Intel's XTU tool. The two stereo speakers at the right and left hand sides of the laptop are surprisingly loud, especially when compared to that of most tablets. An astonishing maximum volume, brilliant highs and even some bass qualify the speakers even for multimedia tasks (although it does of course remain possible to connect an external sound system). The superb speakers are a great advantage whenever the device is used away from home. Just 3.1 to 7.4 Watts while idle? Such values turn the XPS 11 into one of the most power-efficient devices of its class, thanks to both the highly efficient Haswell ULV platform and well-balanced components. However, the true advantage of a Core i5-4210Y (when compared to "ordinary" chips with 15 Watts) only becomes evident under full load. Instead of a maximum power consumption of 25 Watts or more, our test device came in at just 17.2 to 19 Watts - the reward for the decreased clock speed and performance levels. 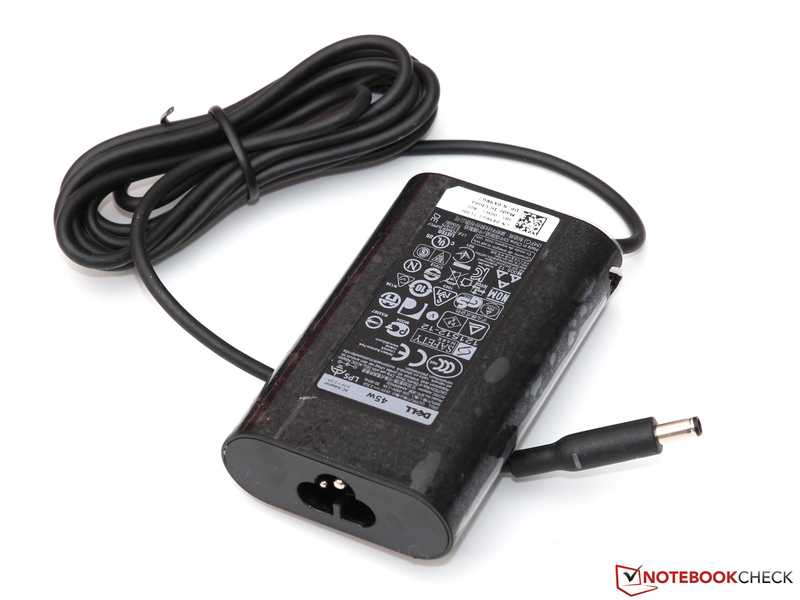 Accordingly, the power adapter (45 Watts) has more than enough reserves to quickly recharge the device even when it is being used. 40 Wh is not much as far as battery capacities go, but due to the low power consumption levels, it should be sufficient for decent battery runtimes. And indeed: More than 10 hours during the Battery Eater Reader's Test (energy-saving mode activated, minimum display brightness, Wi-Fi off) is a fine result. 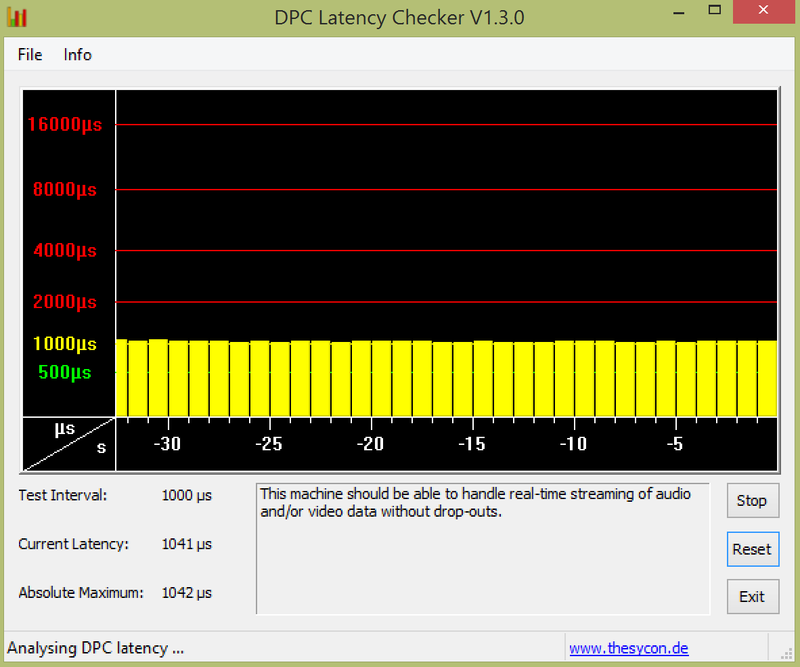 As are the 6 hours of browsing on Wi-Fi or during HD video playback we measured with our more lifelike Wi-Fi test with medium display brightness (set to 150 cd/m²). Under full load of both the CPU and the GPU, as tested with the Battery Eater Classic Test (maximum performance mode activated, maximum display brightness, Wi-Fi on), the battery already dies after a little bit less than 2 hours. At least no further throttling occurs while running on battery. Dell's XPS 11-9P33 proves to be an astonishingly versatile convertible, expertly combining the advantages of a laptop with a tablet. The basic idea of its hinge (360 degrees) is not new, though, as other competitors such as Lenovo have been offering similar convertibles for quite some time now. Still, the XPS comes with premium materials and superb build quality, well worthy of its status as one of Dell's flagship devices. The innards are well chosen, too. Such a sharp and bright display with such great viewing angles can barely be found anywhere else. Photos and movies profit a lot from the extra pixels, while games may not be quite as well suited - the HD-4200 GPU is simply not powerful enough. Apart from this, there is no reason to complain about the performance of the XPS, offering enough reserves for all typical office and web usage scenarios. Thanks to the power-efficient CPU, the rather smallish 40-Wh battery is already large enough to yield decent battery life, maybe even enough for an entire day in the office. 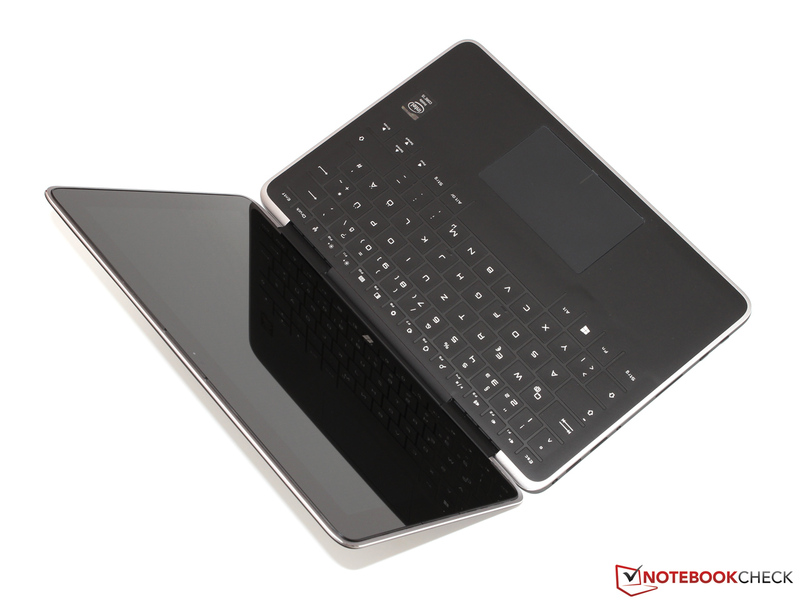 Unfortunately, some major drawbacks do exist, especially concerning the backlit touch keyboard. While it is certainly innovative, the lack of physical feedback will have negative ramifications in terms of typing speed and error rates, especially for inexperienced typists. The XPS 11 might have been a little bit heavier and thicker had it used a traditional keyboard - the customers will decide whether Dell has made the right call here. The same holds true when it comes to the rather high price point of slightly more than 1000 Euros (~$1353), which only gets worse when shipping fees and a warranty extension beyond the usual meager 12 months Dell offers are taken into account. 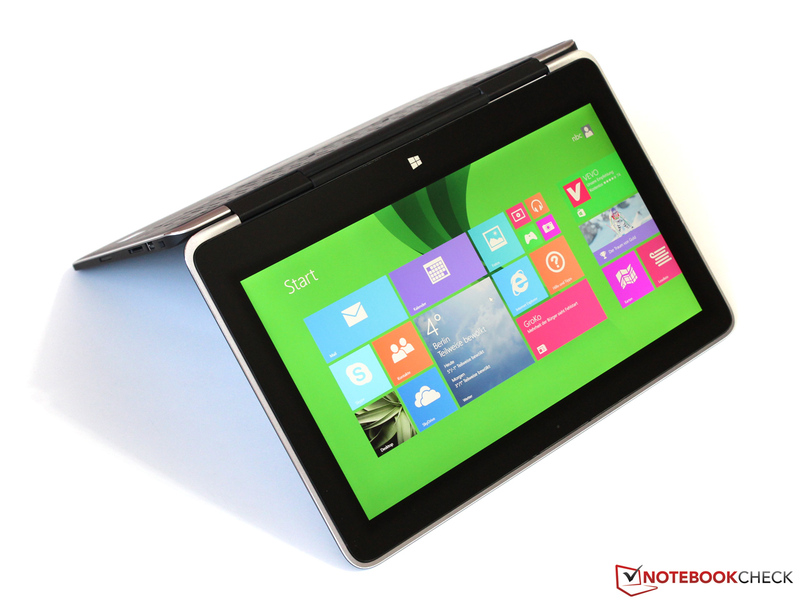 Both the Lenovo Yoga 11S and the Acer Aspire P3-171 may be a suitable (and noticeably cheaper) alternative. The Dell XPS 11 is now available on Adorama for $1369. 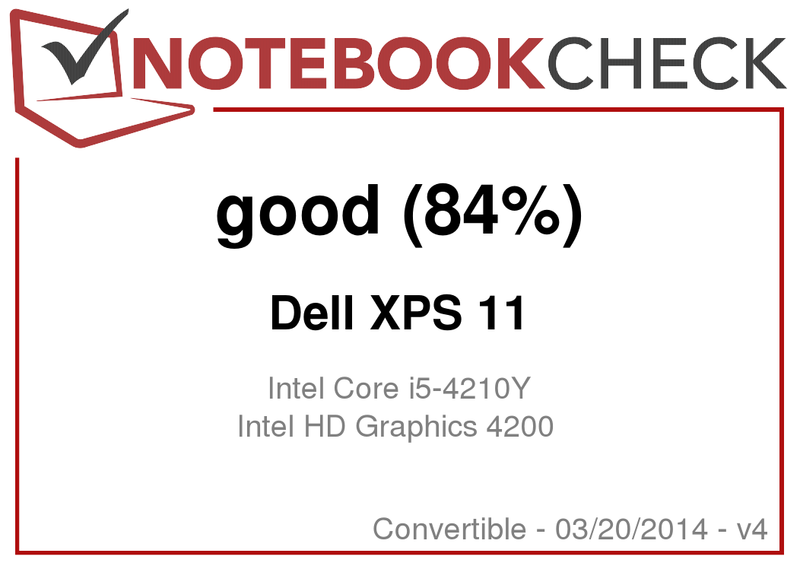 The XPS series takes the top spot in Dell's laptop lineup. 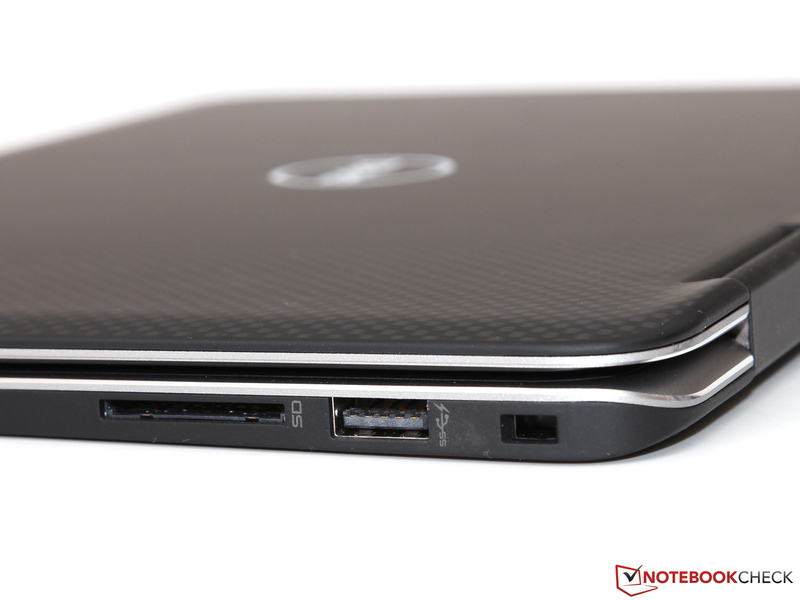 ...turning the XPS 11 into a truly mobile device. ...allowing for a range of different modes. ...leads to noticeable wobbling of the display unit. ...as well as two USB ports can be had. ...and its surface is quite dust-prone. The speakers are surprisingly decent. As with most tablets, there is a hardware volume rocker. ...as well as very low heat emissions. ...the maintenance hatch can be removed. Only the CPU and the RAM are soldered to the mainboard. 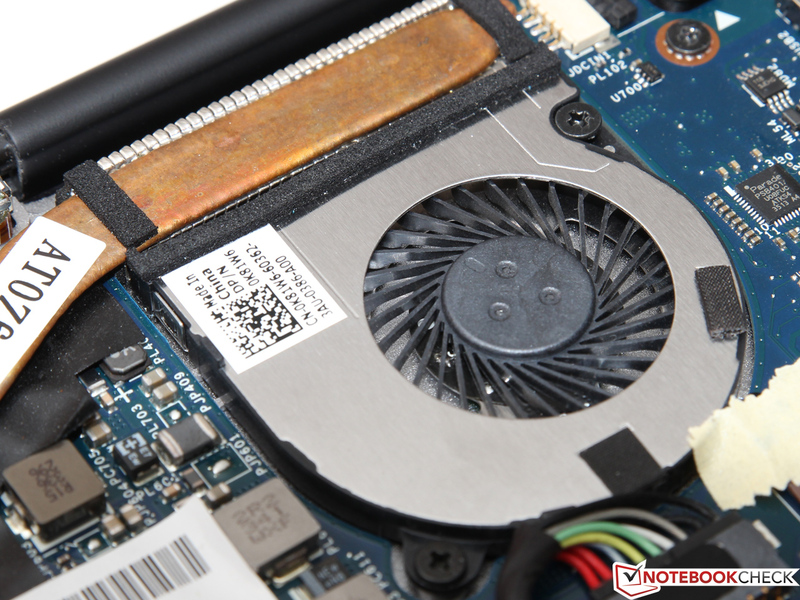 ...transports the excess heat to the lone fan. 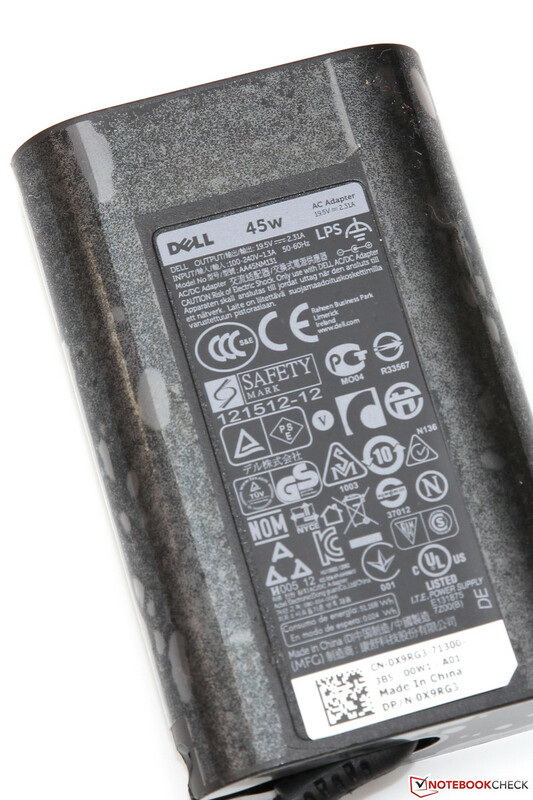 A battery capacity of 40 Wh is sufficient for around 6 hours of battery runtime. ...yields up to 45 Watts. ...but in the shade, the XPS is more than useable. Next to the razor-sharp display, mostly the lightweight chassis with its great build quality - worthy for an XPS series laptop. A "real" keyboard which prolific writers are going to miss dearly when using this machine. While the touch keyboard is a unique and unusual design element (sufficing for short texts), it may not have been the best decision for a lot of laptop usage scenarios. That no more than a meager amount of 4 GB of RAM is offered, not even in a premium variant of an already very costly device. 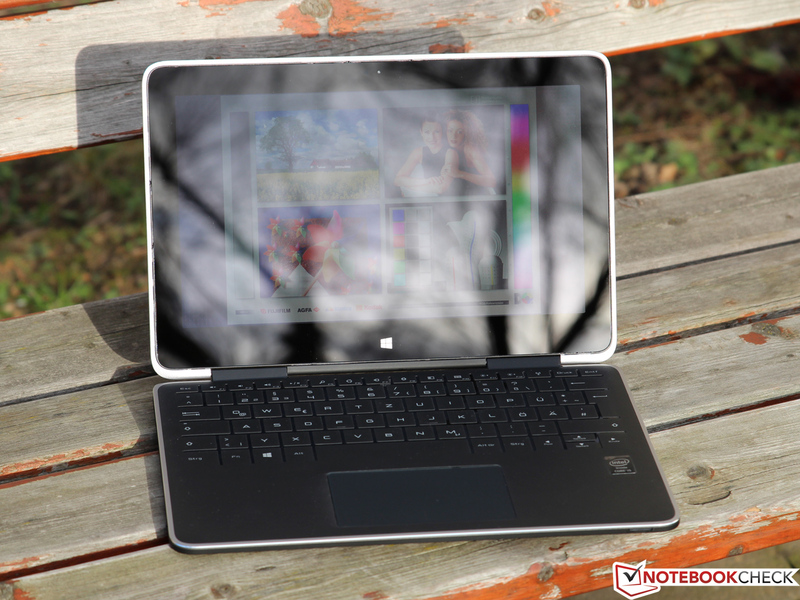 Comparable convertibles can be found in the Sony Vaio Tap 11, the Acer Aspire P3-171 and the Lenovo Yoga 11S. 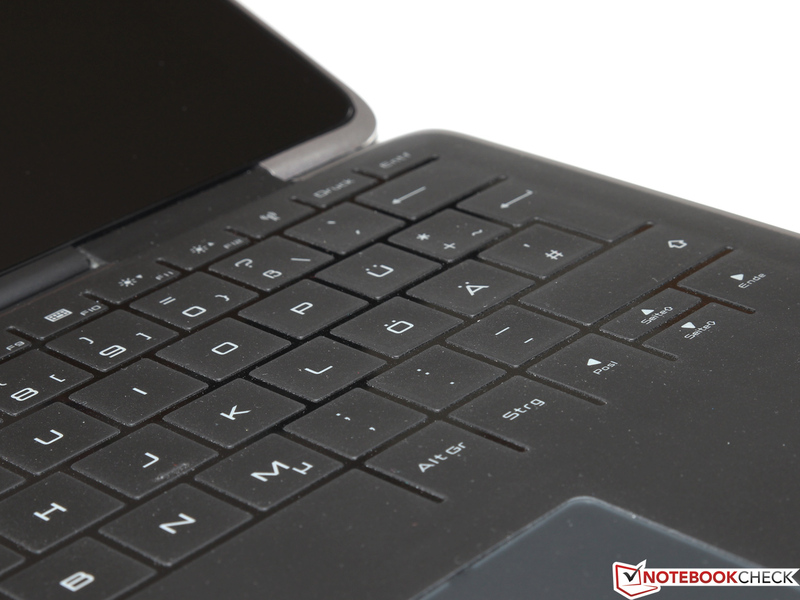 Those who are fond of passive cooling systems might want to take a closer look at the HP Spectre 13 x2 as well as the Asus Transformer Book T100TA.